Robots aren’t great at understanding laundry. The roboticists at UC Berkeley are really ramping up their game with a very clever robot named BRETT (Berkeley Robot for the Elimination of Tedious Tasks). BRETT has been challenged with the task of understanding and folding various bits of laundry. 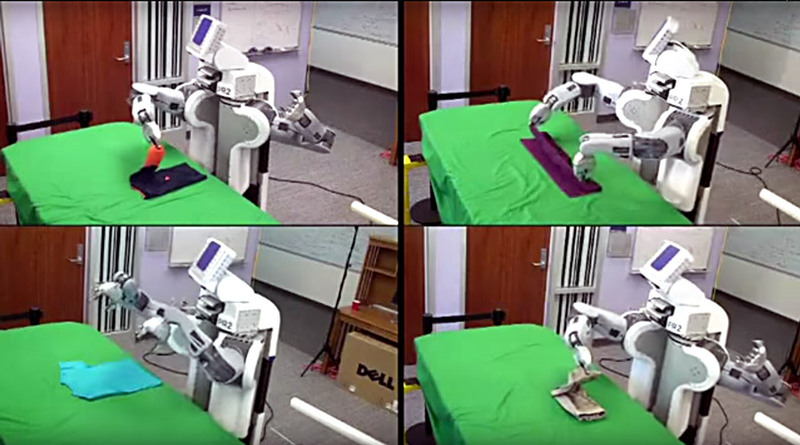 What seems like a very simple task is actually quite problematic from the viewpoint of a robot. The team at UC Berkeley have focused primarily on the tasks that robots are currently limited in their understanding of. It’s easy for a human to determine the difference between a towel and a sock in a pile of laundry, but that is a major stumbling block for a robot at this time. To fold a towel, it takes a human a couple seconds. We inherently understand that the material of the towel is not solid, it drapes and crumples up. A robot does not have the ability to sense these things, and has to jump through extra hoops to reach a workable understanding of the material. In this case, BRETT finds the corners of the towel, and solves an easier problem. This is still a time consuming process, taking between 11-20 minutes, assuming a sock didn’t throw off the reading. Very interesting work, and it is worthwhile to see the team pushing past the current limitations of robotics! This entry was posted on Monday, June 8th, 2015 at 10:19 am	and is filed under Misc. You can follow any responses to this entry through the RSS 2.0 feed. You can leave a response, or trackback from your own site.